The following resources are the original creations of Moth and Rust. We made them for you to use so don’t steal them. Why would you steal your own stuff? It just doesn’t make sense. We hope that our resources are a blessing and that they will lead you to make much of Jesus. Seriously though, don’t steal your own stuff. I mean, come on. Plus thieves smell funny (slight joke at the expense of our essential oils people… sorry). If you’d like to reproduce something from Moth & Rust just let us know. Resources are meant to be used. Inner-Monologue from the woman behind the man behind the pulpit. Wife, mom of 4, and unsure about publishing her thoughts for the entire world to see... but willing to share her heart in the hopes of being a blessing. 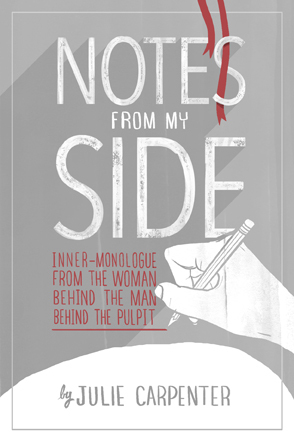 Notes From Her Side is a collection of musings from some of our behind the scenes M&R team. These serve a dual purpose. For our ladies, this is meant to bless and serve as an encouragement for all who work and minister alongside your church and/or your spouse. For the men… fellas… we all need a little perspective and very often there is wisdom that pours from the heart of our women.